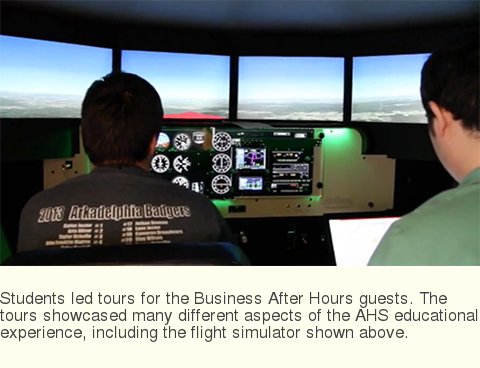 Business After Hours at AHS from Arkadelphia Public Schools on Vimeo. During the spring 2014 semester, Arkadelphia High School hosted a Business After Hours with the Arkadelphia Area Chamber of Commerce to showcase the diverse range of quality academic and extracurricular programs available at AHS. This was the second year for AHS to host a Business After Hours event, and having it at the high school and led by students offers a great opportunity for local community leaders and businesspeople to appreciate all that is offered on campus. The 2014 theme was "A Great American High School." Students were asked to think about what that means to them and express their thoughts through essays and videos. At the event, New Tech students led tours for attendees as well as ran booths showcasing work they have been doing. There were tables and presentations featuring Junior ROTC, aviation, Badger football, AHS jazz band, the pre-engineering department and robotics, EAST Initiative, the AHS theatre department, Arkadelphia Promise, and many others. Arkadelphia High School serves 9th-12th grade students in the Arkadelphia Public Schools, Clark County, Arkansas - Home of the Arkadelphia Promise. Featuring Bud McMillion, GeoDesign and Lead AHS New Tech Instructor.